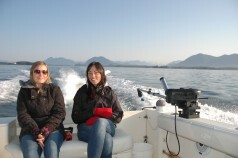 Complete Comfort with Cleanline Sportfishing, Tofino B.C. Whether you’re concerned about a smooth ride, comfortable seating for 5, or want to know that your captain and vessel meets all Transport Canada requirements, Cleanline Sportfishing excels above the rest. Higher than average gunwale height–safer for all guests especially elderly, or young children. Twin Engine reliability–auxillary back-up power is essential. The newest, by age and model, addition to the Tofino Charter fleet, our 27′ Sportfishing machine, “Off the Hook” offers a state-of-the-art sportfishing platform ideal for the West Coast environment –pristine cleanliness and all components top-of-the-line. A safety briefing is conducted before each voyage to familiarize all guests about the safety fundamentals aboard our vessels. I have been salmon fishing for 31 years in B.C. waters. I have fished from Victoria to the Queen Charlotte Islands. I have chartered with small and large operators. Fishing with Blake at Cleanline Sportfishing is second to none. Blake provides a great experience that is fun, safe and at a very reasonable cost. My friend and I are booked again this year–we can’t wait! Blake is an excellent fisherman and a pleasant guide. I would recommend Blake’s fishing charter to anyone.